France. During her Senior year at Vanderbilt, she attended a five-day missions conference for students and discovered an amazing thing: God had missionaries in France, and she felt God calling her there. After graduation, she spent eight months training for the mission field in Chicago, Illinois and then two years serving in a tiny Protestant church in Eastern France where she met her future husband. Elizabeth lives in southern France with her husband and their two sons. She find her work as a mother, wife, author and missionary filled with challenges and chances to see God’s hand at work daily in her life. Inspiration for her novels come both from her experiences growing up in Atlanta as well as through the people she meets in her work in France. Many conversations within her novels are inspired from real-life conversations with skeptics and seekers alike. 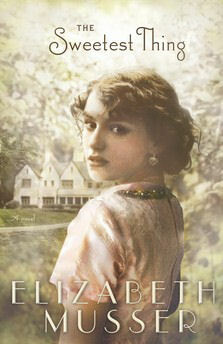 Her acclaimed novel, The Swan House, was a Book Sense bestseller list in the Southeast and was selected as one of the top Christian books for 2001 by Amazon's editors. Searching for Eternity is her sixth novel. Compelling Southern Novel Explores Atlanta Society in the 1930s. The Singleton family’s fortunes seem unaffected by the Great Depression, and Perri—along with the other girls at Atlanta’s elite Washington Seminary—lives a life of tea dances with college boys and matinees at the cinema. When tragedy strikes, Perri is confronted with a world far different from the one she has always known. At the insistence of her parents, Mary ‘Dobbs’ Dillard, the daughter of an itinerant preacher, is sent from inner-city Chicago to live with her aunt and attend Washington Seminary. Dobbs, passionate, fiercely individualistic and deeply religious, enters Washington Seminary as a bull in a china shop and shocks the girls with her frank talk about poverty and her stories of revival on the road. Her arrival intersects at the point of Perri’s ultimate crisis, and the tragedy forges an unlikely friendship.